in another website I read that some 01-02 fbodies came with a ls6 block from factory. has anyone else heard this before or even confirm this? they say the difference you can tell is the ls6 block is duller in color than the ls1 block. Some did come with the LS6 block but it had LS1 internals. You can tell by the number stamped on the block. The color part is just talk..
10% (roughly) from 2001 had the LS6 block. 25% (roughly) from 2002 had it. Doesn't really matter that much...unless you plan on modding like freaking nuts. I forgot to ask too what number is for what block? There is a number on top of the block behind the driver side head. It's quite difficult to see -- you'll need a telescoping mirror and a flashlight. 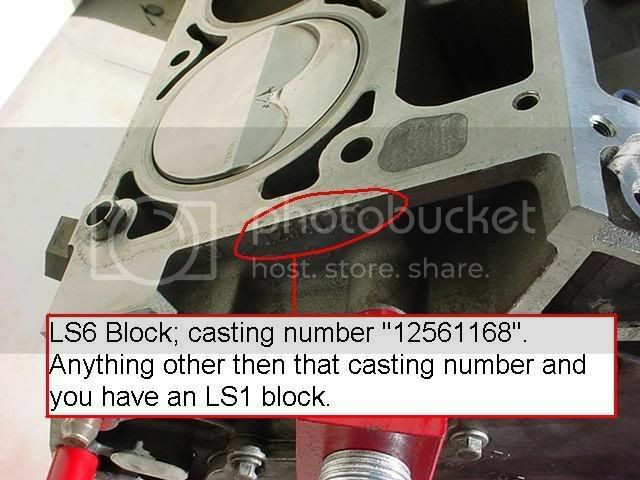 I think the LS6 block number is 12561168.
that's dumb. maybe when I do a head and cam job on it, I could have a better chance seeing or is there another way find out by vin#? no. only other way is to look at it side by side to an LS1 block, LS6 blocks have a slightly darker cast than LS1s. it is most certainly true, ls1 and ls6 blocks were cast in different plants (IIRC, one in the States/Canada and one in Mexico) this resulted in a noticeably different cast. LS6 on the left and LS1 on the right. note the significant color difference. Last edited by justinmc978; 09-13-2010 at 02:45 PM. the ls6 has more cooling ports to correct. Last edited by tatertot91; 09-13-2010 at 05:25 PM.